St. Lucia Segway Adventure Guests are picked up and are taken to the ‘LucianStyle Experience Center’ located in the heart of the tourism capital, Rodney Bay. After a brief orientation, guests are escorted over to our Segway adventure track and taught how to ride the amazing Segway X2. After about a ten minute lesson the group gets to head ‘off-road’ on the LucianStyle exclusive 2 mile-long Nature Trail, part of an abandoned US Navel Base. On the trail, guests will enjoy amazing views of the Rodney Bay coastline, Pigeon Island, Mount Gimie, Reduit Beach and Martinique. Stops are made to feed fish at Stone Face Fish Pond, enjoy local fruits, and to learn about local flora along with the military history associated with the ruins of Mt. Pimard. The tour lasts for about 2 hours and ends at the same location that it starts at. Guests are then taken back to their respective points of pickup. First guests enjoy a twenty minute orientation and practice session conducted on our very own Segway Practice Track. After everyone becomes familiar with the amazing balance controls of the Segway X2, we head off to explore the historical wonders of Mount Pimard right in the heart of Rodney Bay while gliding” along our exclusive 2 mile long, well-groomed trail system. The fun and informative guides will talk about everything from the beautiful flowers and butterflies to the battles between the English and French for our fair Helen of the West. There are many beautiful photo spots and educational stops along the way such as the now sealed bunkers that once served as tunnels, storage and lookouts for the American Military during World War 2. 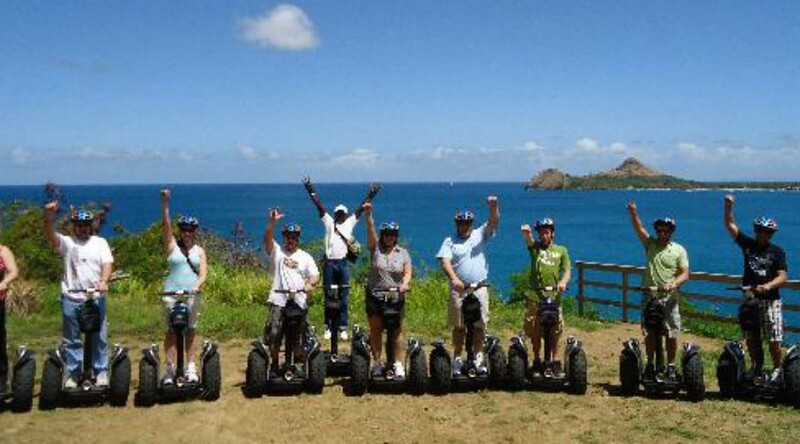 Guests will enjoy beautiful vistas of Pigeon Island, Reduit Beach, The Rodney Bay Marina and the Caribbean Sea all while gliding effortlessly on their intuitive, eco friendly Segway X2. Some of our other stops include a naturally occurring pond where we stop to feed the fresh water fish and a local fruit stop at our highest view point. The tour concludes on beautiful Reduit Beach with a wonderful local dinner while the sun sets. Great photo opportunities.